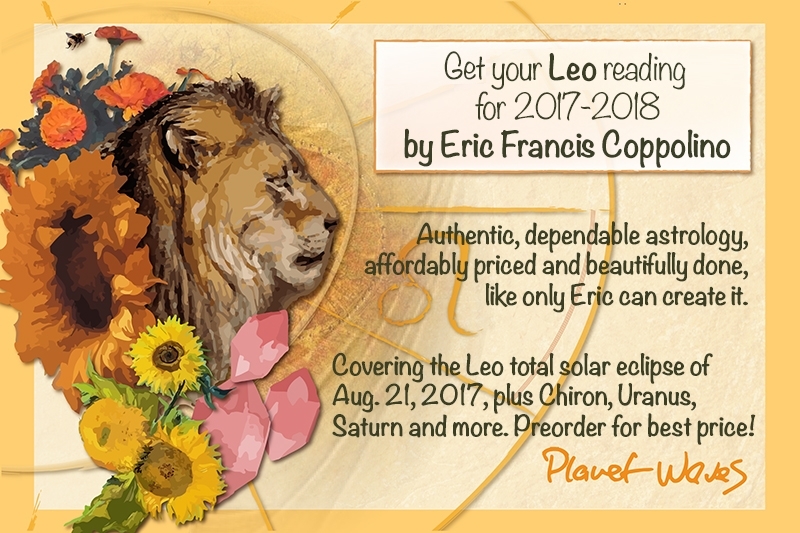 Today the Leo Sun makes a grand fire trine with Eris in Aries and Ixion in Sagittarius. Even though it looks more like a ‘triangle of fire’ than a ‘ring of fire’, the principle is the same; and it’s up to you not to burn out of control. A few things look like they will help you light your spark constructively. Today’s Birthdays: Arthur Cayley (1821-1895), Gabriel Lippmann (1845-1921), Mary Gilmore (1865-1962), T. E. Lawrence (1888-1935), Fess Parker (1924-2010), Charles Bukowski (1920-1994), Ann Blyth (1928), Diana Wynne Jones (1934-2011), Robert Squirrel Lester (1942-2010), Kevin Ayers (1944-2013), Bob Balaban (1945), James “J.T.” Taylor (1953), James Cameron (1954), Angela Bassett (1958), Madonna (1958), Steve Carell (1962), Emily Robison (1972), Bob Hardy (1980), Arden Cho (1985), Evanna Lynch (1991). 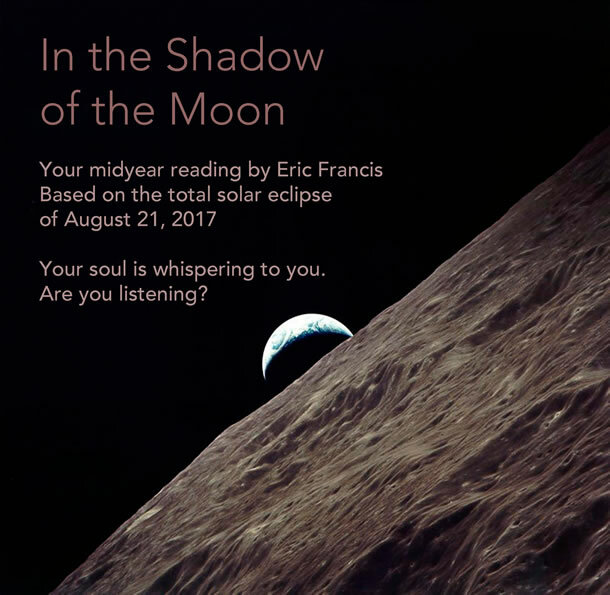 In tonight’s edition of Planet Waves FM [play episode here], Eric surveys the world as we approach Monday’s total solar eclipse. However, we also travel back in time to August 1999, when a comparable event was approaching: the infamous grand cross total solar eclipse of Aug. 11 that year. For many reasons, they are comparable times in history: the anger, the nuclear issues, the influence and impact of the internet. Moon Sign: Moon is in Gemini and enters Cancer on Aug. 17 at 9:13 am PDT / 12:13 pm EDT (16:12:53 UTC). — Sun trine Eris at 4:55 am PDT / 7:55 am EDT (11:55:30 UTC). 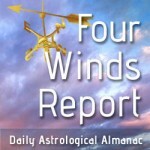 — Sun conjunct True Node at 3:12 pm PDT / 6:12 pm EDT (22:12:10 UTC). — Mars square Echeclus at 4:21 pm PDT / 7:21 pm EDT (23:21:02 UTC). Your current heading is close to the direction you need to be going. You only have to make minor adjustments, based mostly on feeling than on some detailed thought process. The main thing you need to tweak is making sure that you have multiple sources of income rather than just one or two. You serve many purposes; this will be easier than you think. Today the Leo Sun makes a grand fire trine with Eris in Aries and Ixion in Sagittarius. Even though it looks more like a ‘triangle of fire’ than a ‘ring of fire’, the principle is the same; and it’s up to you not to burn out of control. A few things look like they will help you light your spark constructively. One is to remember that no matter how tempting it might be to use subterfuge or provoke others to attain a goal, that’s not how true leadership works — and it’s not very compassionate or heart-centered behavior. Lest you think you could never be so tempted, Ixion is a reminder that anyone is capable of anything. The second thing is to remember that we each have our own personal ‘sword of Damocles’ above our heads, and abusing power is a sure way to meet it. Finally, let yourself be pushed by your deeper healing goals. Using those tools takes more work than what might feel like ‘the easy way’ today, but it’s worth it. Always.